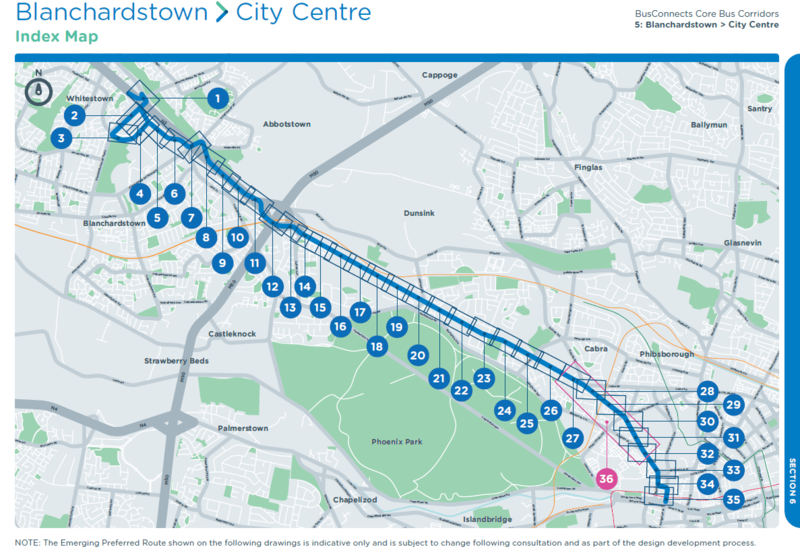 COMMENT & ANALYSIS | LONG READ: Recently this website reported on the the first four BusConnects infrastructure routes have gone out to public consultation and now we’re looking at the details of each route. We’re starting on maps 33 and 32 combined in the Smithfield area and heading north and then west towards Blanchardstown. 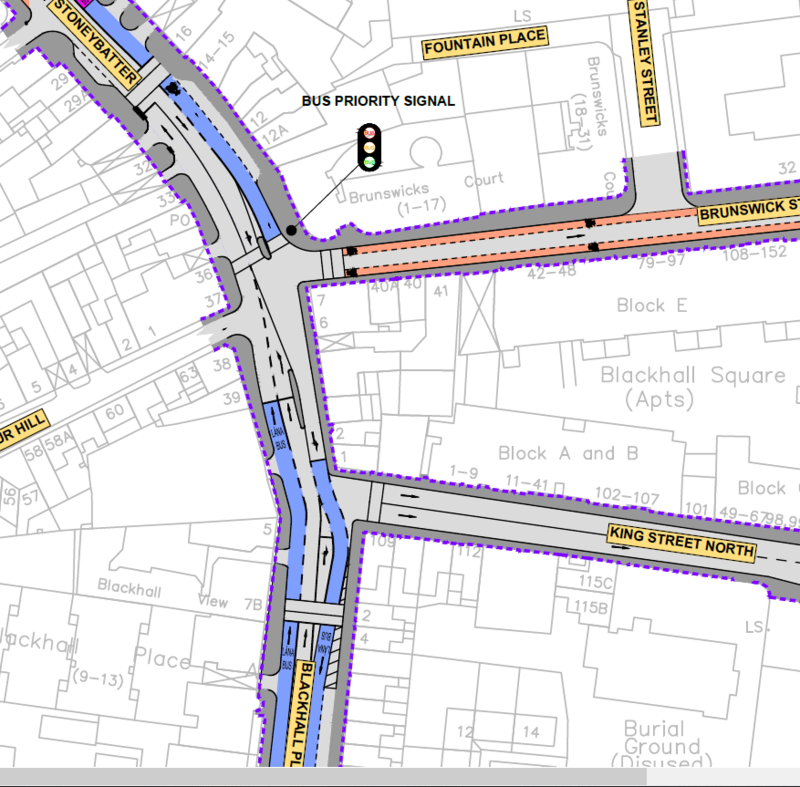 This article is part one where we’ll look at the details between the quays and the Navan Road. 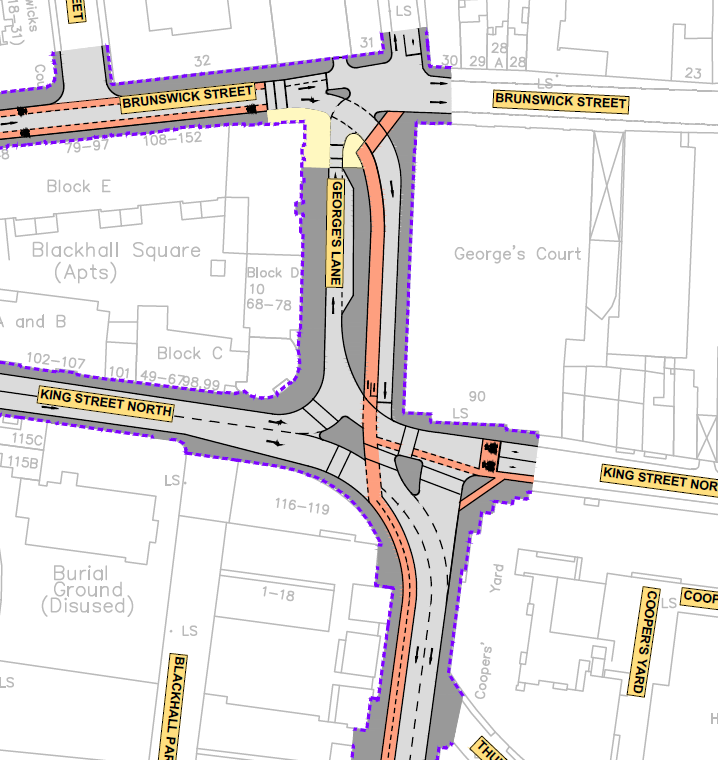 There’s very little changed for most of Blackhall Place, just bus lanes extended more towards junctions and the car parking spaces currently marked in some of the bus lanes appear to be removed. 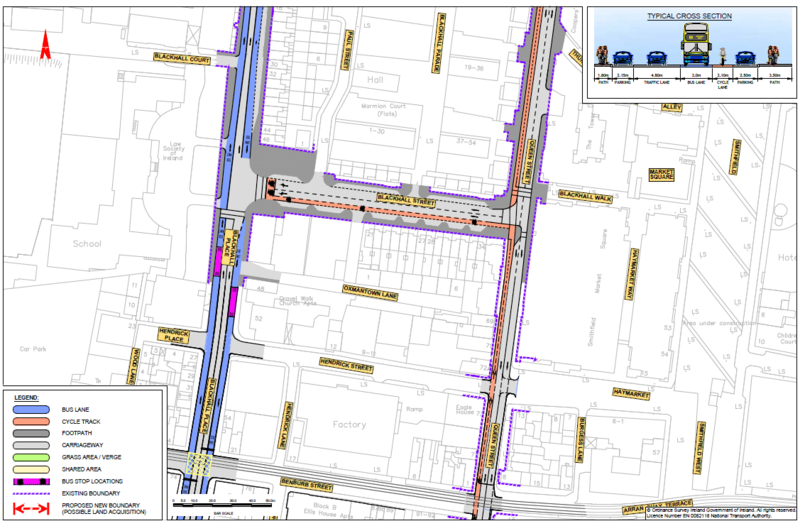 The main change here is for cycling on Queen Street — a traffic lane is removed from the currently three-lane street. A narrow, low-standard two-way cycle path added in its place. 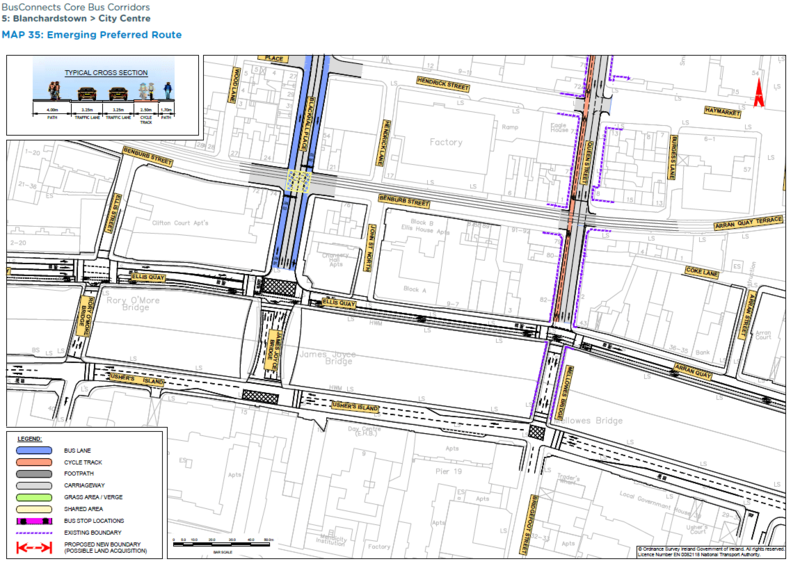 Note: The outline of a cycle route of the quays here is an old plan for the Liffey Cycle Route — the new plan for the Liffey Cycle Route is suppose to differ from this. After many delays, the new design is due to be made public early next year. 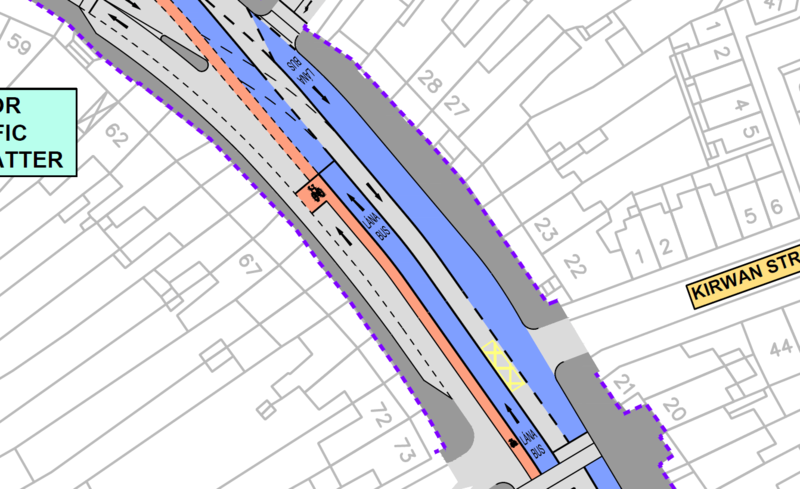 On Queen Street the cross-section below shows that the general traffic lane widths are drawn to a highly excessive 3.25 metres per lane, given that the speed limit is 30km/h and under 3 metre lane widths can be used for that speed. Even keeping the lanes at 3 metres would be designing-in speeding as 3 metres is recommended for 50km/h roads and streets. Below are possable alternatives, suggested by this website (not the NTA). 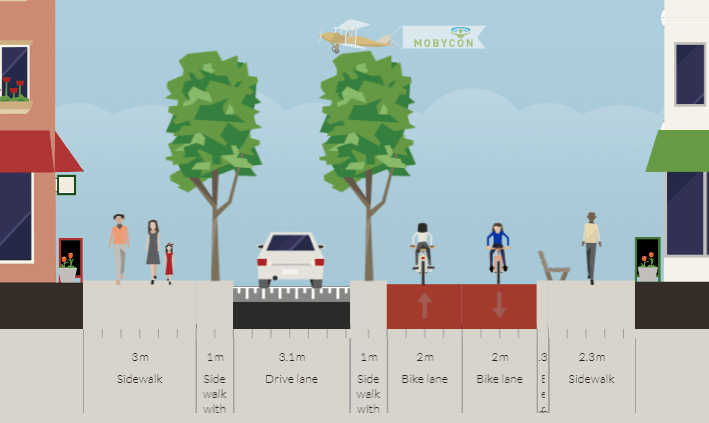 It’s not clear where the 4 metre footpath shown on the official cross-section is on the street — if it’s a planned widening, it would be strange to widen the footpath on the private housing side of the street without widening it on the public housing side of the street. 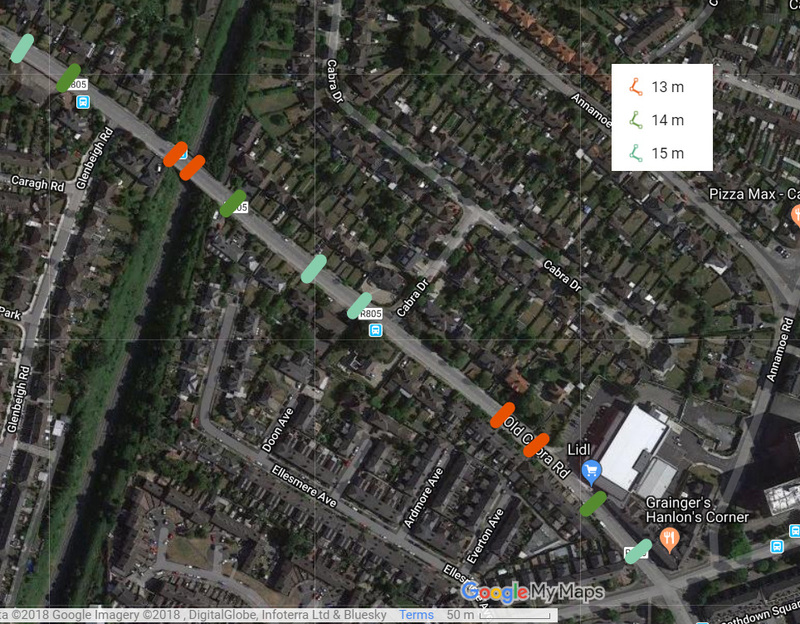 But in the alternative examples, we have left the widths of the footpaths the same to illustrate what can be done without changing the footpaths widths as proposed by the NTA. Or maybe we should take into account that the area — even with loads of sites still undeveloped — has a population density of just shy of 10,000 people per square km (99,777 in 2011) and low car ownership? 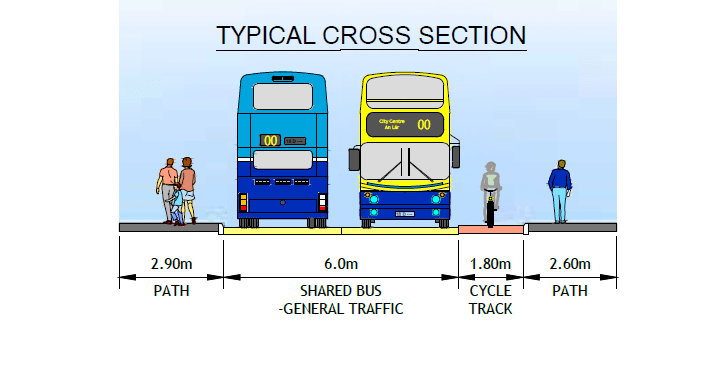 With very high density housing packed with people on both sides of the road and BusConnects reducing space on routes around the city, isn’t this an ideal place to lower the car dominance in the use of space? Bring a bit more greenery into the north inner city? 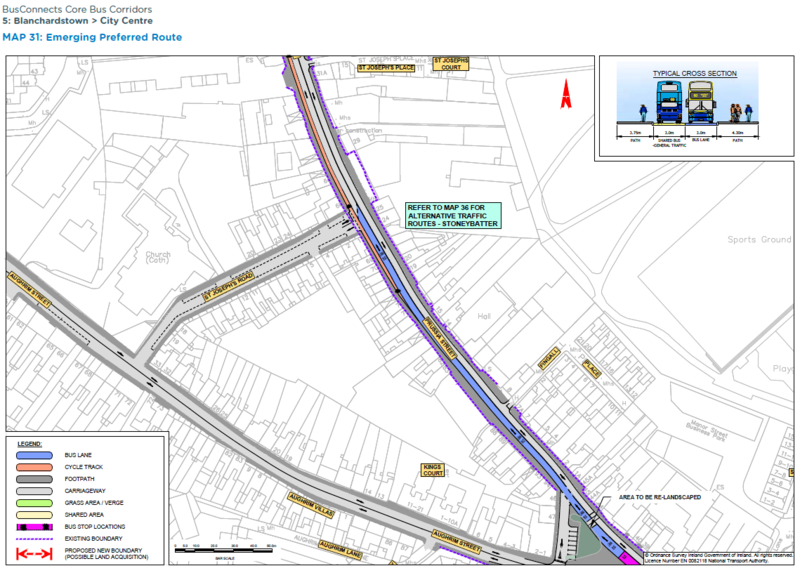 The two way cycle path as outlined lacks any buffer and that means turning on and off the path into side-streets across the general traffic lanes will be difficult both in terms of safety and not blocking other cycle path or road users. 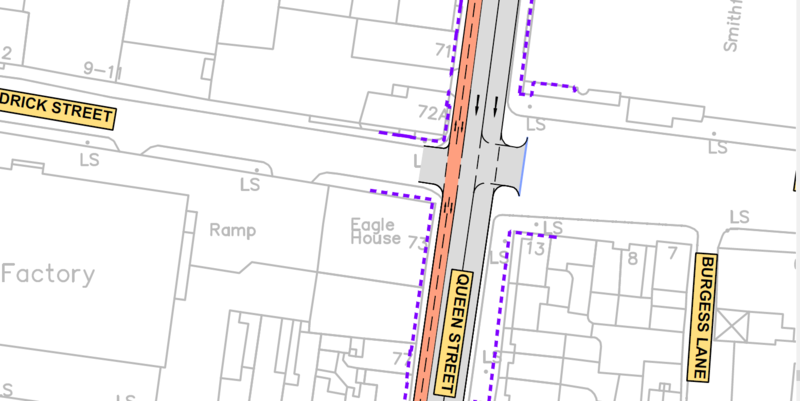 And all the side-streets on the left of the images directly above and below this text (west of Queen Street) are one-way and no contra-flow cycling is provided for to help make the Queen Street cycle path a more attractive alternative to the bus lanes on Blackhall Place. It’s worth noting that it’s not clear what kind of buffer the cycle path is supposed to have, if any. 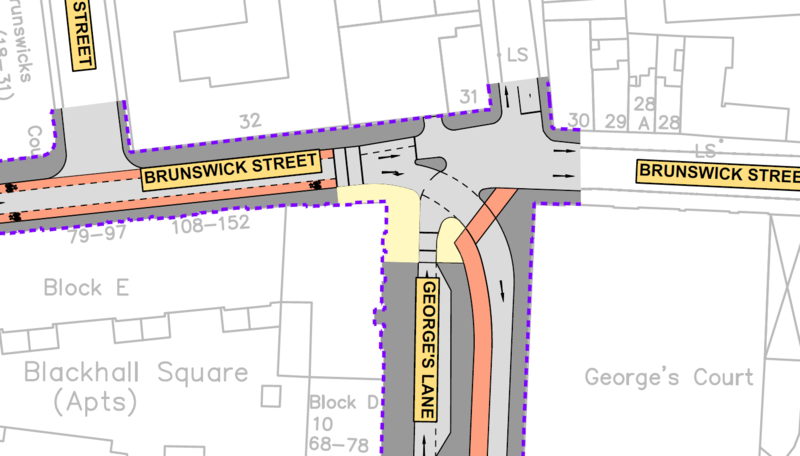 The junction at Brunswick Street is as bad or worse — George’s Lane currently offers pedestrians a bit of breathing room from the area’s generally narrow footpaths but now it’s been cut in bits for a southbound general traffic lane which is currently not provided for and it is unclear why it is being provided for here. 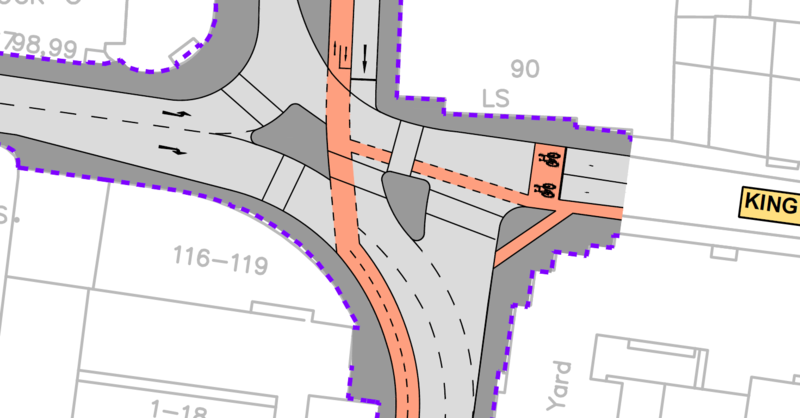 Overall both junctions are overly complicated and cycling. Below, walking and cycling are also mixed on the surfaces highlighted in yellow. Brunswick Street currently has a section of parking-protected contra-flow cycle lane near this junction, before the road becomes two-way. 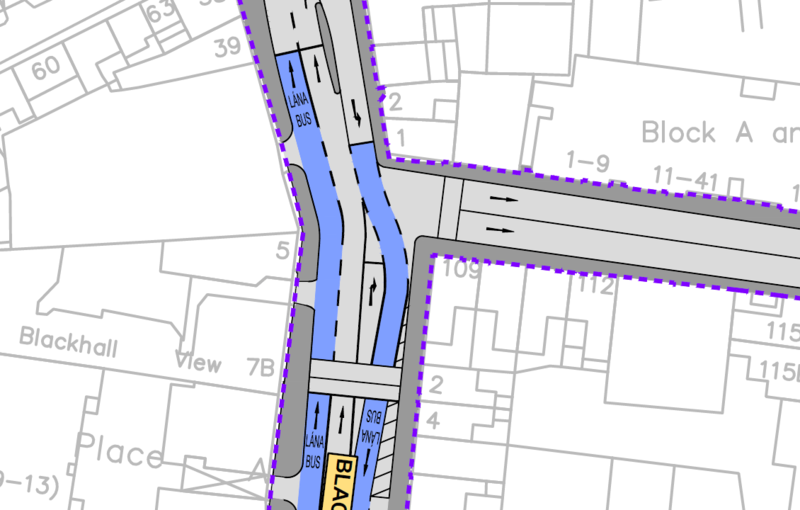 The plan is to have the full street one-way and to have the dashed-lined cycle lanes in both directions — in other words contra-flow with no protection. The will also be very little street parking in the area, which will likely result in more parking in cycle lanes on streets like this. 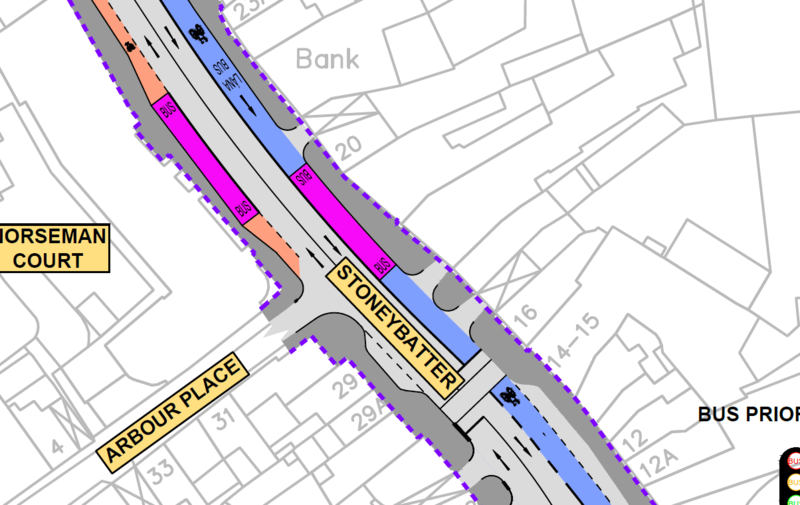 The two junctions linking Blackhall Place to Stoneybatter look to have some good bus priory, but also seem to suffer from trying to do too much in a small space. And below is the junction at the south end of Stoneybatter. Heading north there is no bus priority and no cycle lane or path, despite it being uphill. 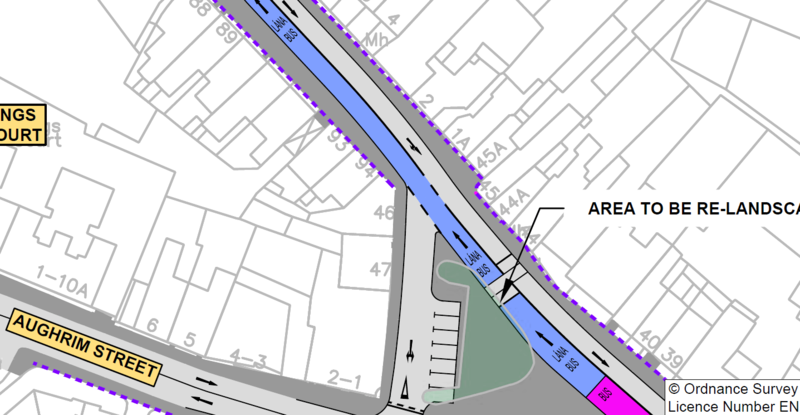 It is unclear how exactly this new signalised junction can work with the narrow Arbour Hill (road to the left) — the rat running on it is already overdue to be tackled. The recent adding on narrow footpaths further along the street doesn’t cut it. 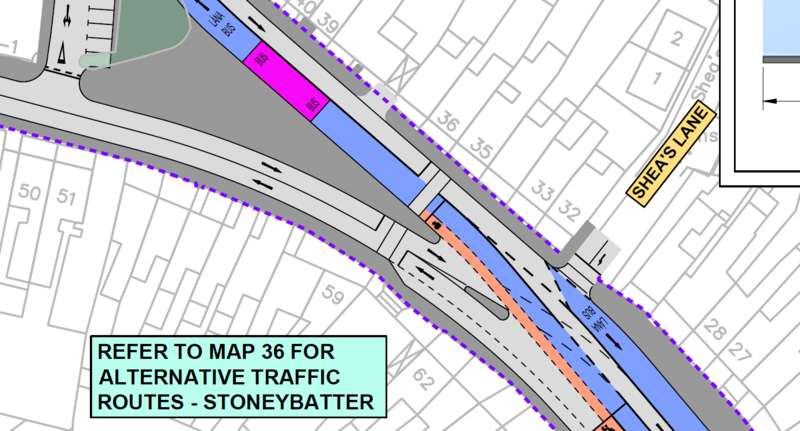 The image below is the cross-section of where there is parking along this section of the street, Stoneybatter — note that the footpath on the right of the image below is mainly so wide because it includes parking at other points, at which point the footpath narrows (see drawing directly above). Manor Street shows more sub-standard space for cycling — this time the cycle lane is sandwiched between a general lane and a bus lane. 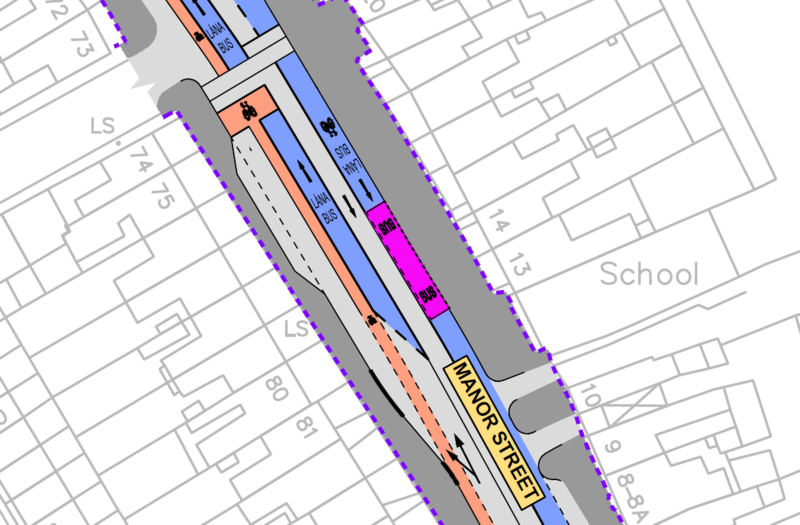 I’ve cycled up Manor Street many times and it’s far from enjoyable… but putting people who cycle exposed between a general traffic lane and a bus lane for the length of Manor Street seems like a new form of cruelty. The start of Prussia Street shows how the street is planned to be one-way for general traffic and there’s a bus lane northbound. 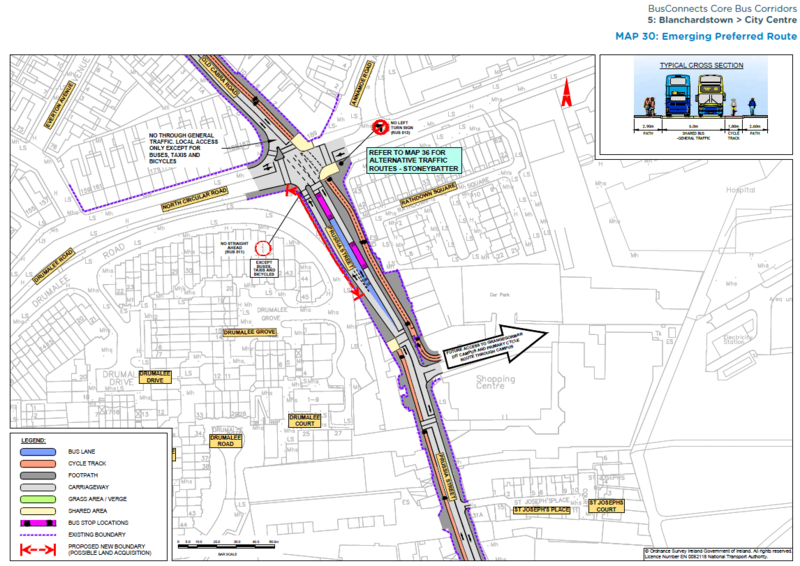 Traffic diversions on Prussia Street are not as severe as first impressions might give expect: car drivers on the Old Cabra Road and the roads linked to it are given a clear run down to the quays. The most that will happen is getting stopped at a bus-priority traffic light the odd time. There is more disruption on the return journey but according to transport planners, it’s the outward trip on which people often decide what mode of transport they will take. Cars and other private traffic going northbound have little of a detour to get back to Prussia Street — with St Joseph’s Road likely to turn into more of a rat run. Map 30 covers the northern end of Prussia Street, up to Hanlon’s Corner (the junction with the North Circular Road), and the start of the Old Cabra Road. This cross-section is provided with these drawings but it’s not clear what it is of — possibly the mid section of Prussia Street? 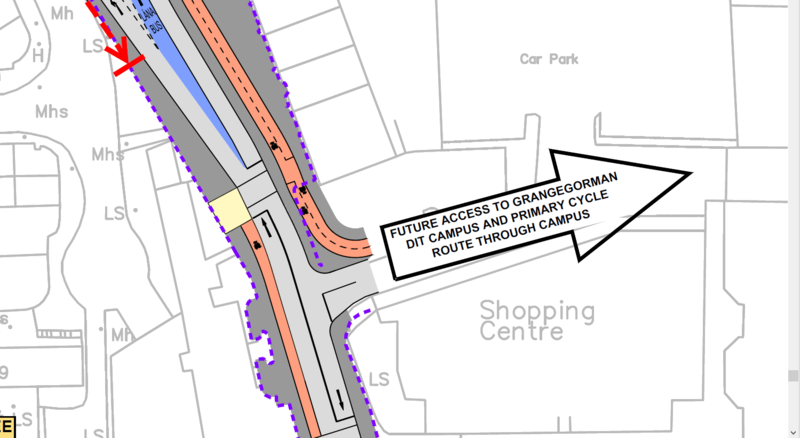 At the Park Shopping Centre on Prussia Street it states that a two-way cycle path links with “future access to Grangegorman DIT Campus and Primary Cycle Route through campus”. This sounds good, but the Grangegorman Development Agency who is responsible for the campus are strong-headed about shared walking and cycle paths, 10km/h “speed limits” for cycling and they think “cyclists dismount” signs are acceptable on a new east-west link through part of the campus (see here and here). 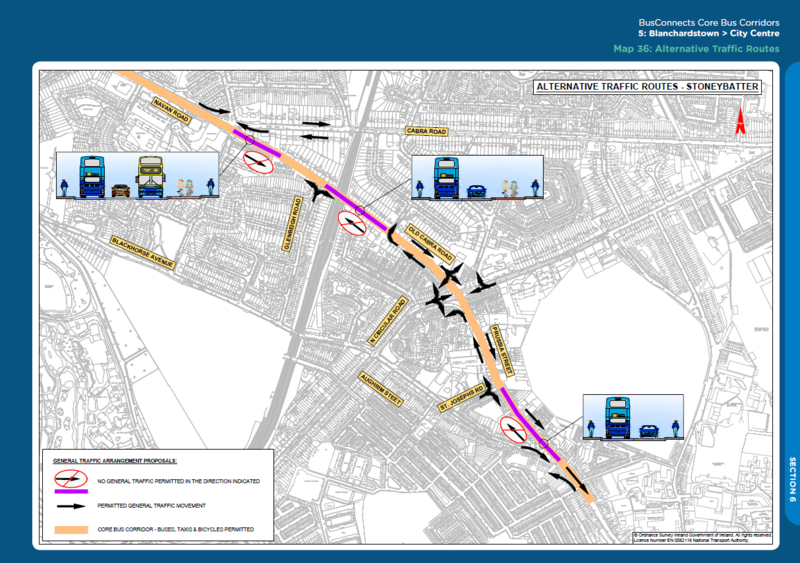 The North Circular Road junction is a mess with more mixing of cycling and walking and halfhearted bus priority. In terms of cycling the designers are again focused on cycling along the route, with no attention to properly upgrading the junction. 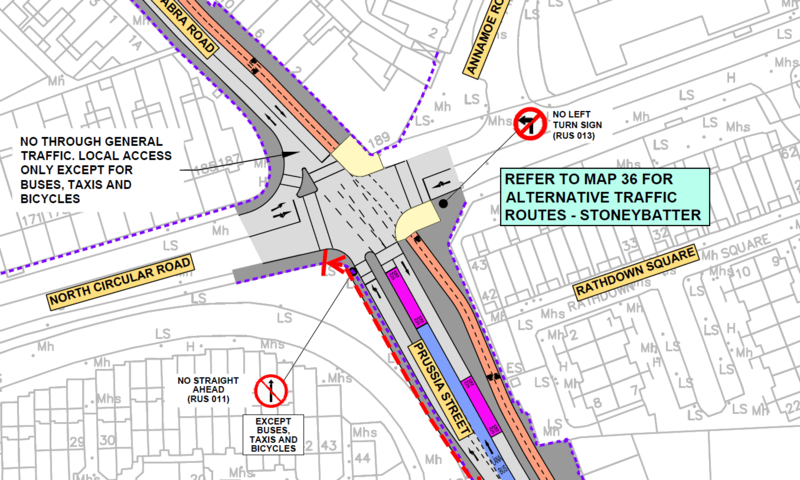 Retaining the left slip turn here is poor in terms of safety and priority for walking and cycling and against national policy. The new Lidl (marked in purple, below) on the Old Cabra Road with its main car park (in yellow) and a secondary entrance on Annamoe Road (in blue). 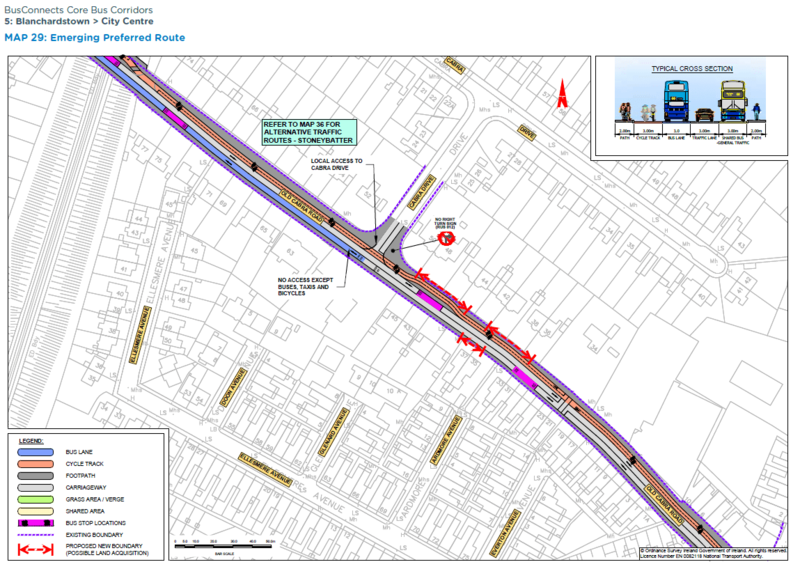 But the link between them (red line with arrows) is pedestrian only, so, access to the main car park is only via the Old Cabra Road. The plumber’s supply company (green) has most of the car park on the Annamoe Road side and has clamping signs up on its part of the car park. 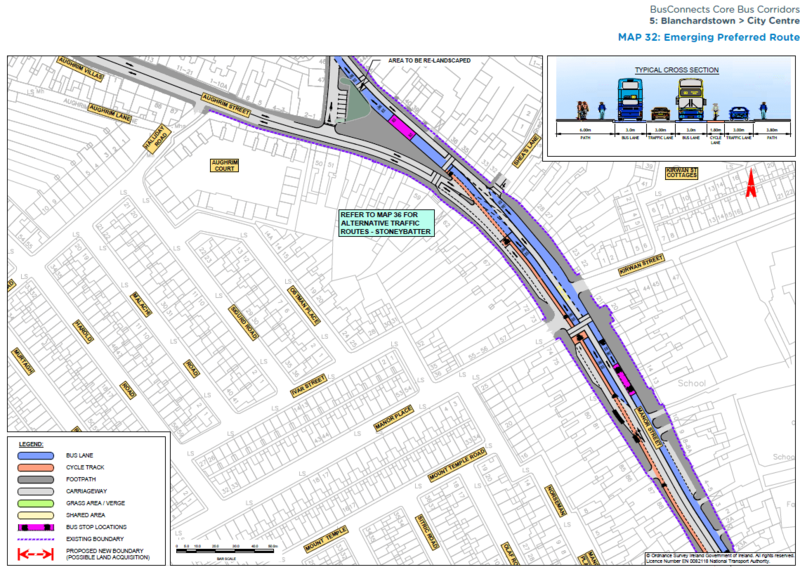 It’s questionable why a full bus gate isn’t used at the railway bridge mid-way on the Old Cabra Road is not used — this would simplify things by proving better bus priority with fewer bus lanes. 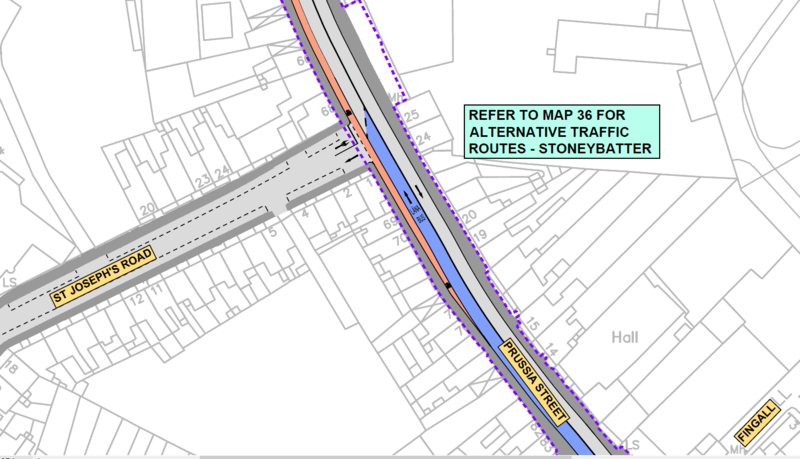 Residents would be able to drive in both directions outside their houses, just with through access disallowed. The two-way cycle path which started at the Park Shopping Centre continues along the Old Cabra Road and up onto part of the Navan Road — we’re known to be fans of two-way cycle paths but it just seems to be a bad idea in this case — too many driveways, the Lidl entrance, and side streets in too much of a confined space to make it work safely and give cycling a good level of priority. 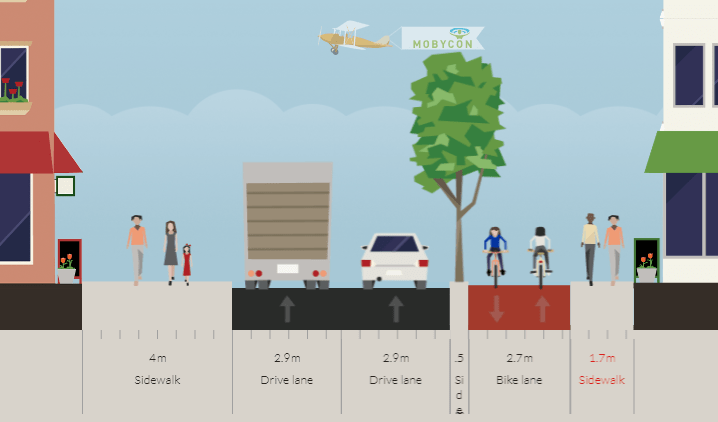 And the below options show us what can fit in — decent sized footpaths, better one-way cycle paths and two lanes in each direction. 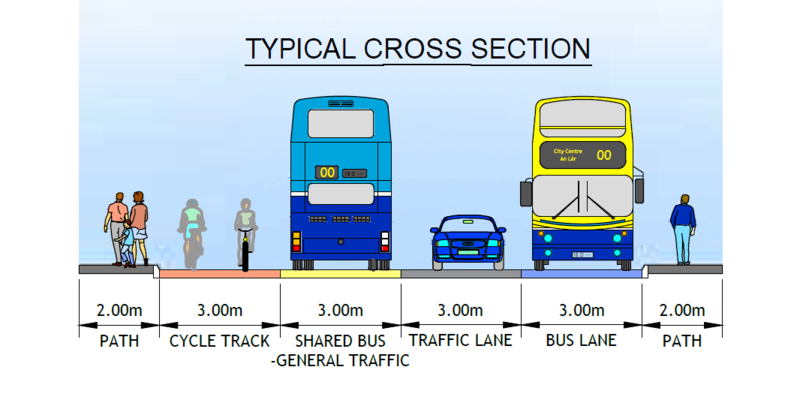 These are just examples based on estimates of the width on the road, and can be rigged more if needed. 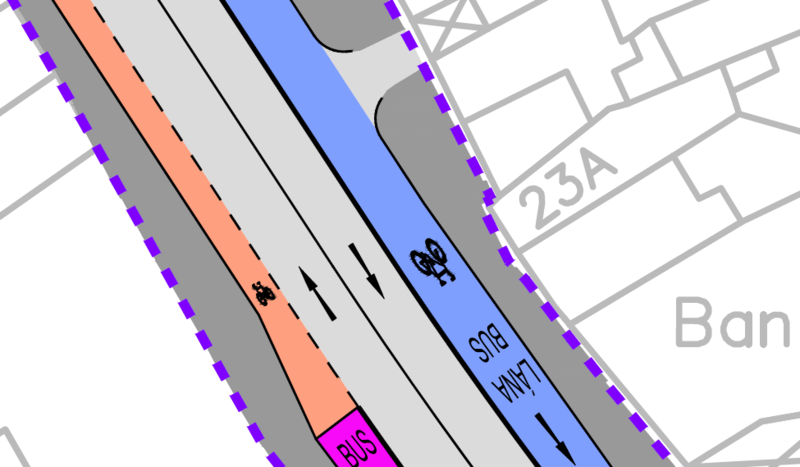 Bus stop bypasses / island bus stops can be provided with similar or maybe a loser level of CPOing which is planned. 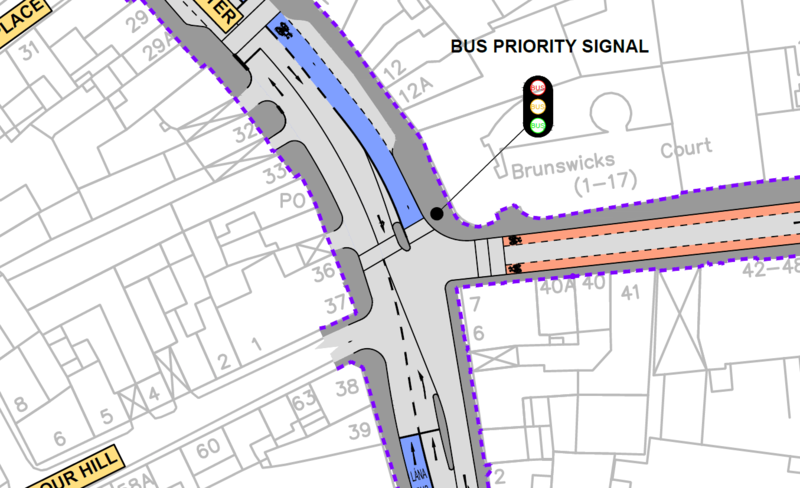 There is no question this is one of the hardest routes to provide bus priority on, but the overall unanswered question on this section and especially in Stoneybatter is has the right mix been found yet? Is increased bus priority and continuing to have car access in both directions and a good deal of car park worth it at the expense of cycling, walking and public space? Has a one-way system for cars been looked at or has the NTA looked at removing more car parking? The approach so-far seems to be try to fit in all that’s there now rather than looking at what could be or to give priority to walking and cycling. It’s also very traffic focused — for example, there’s clearly trees removed but not a potential new tree location to be seen on any drawings. Not looking at the wider picture is a huge failing of the designs so-far — these aren’t just roads, they are streets, urban centres and communities. 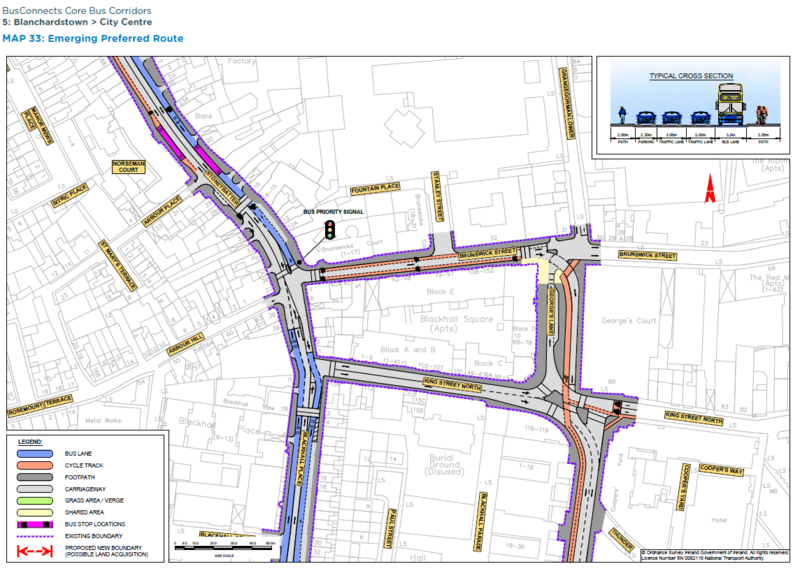 If the NTA were serious about giving cycling priority on a detour route we’d see the details in Grangegorman, far more east-west cycling links to it and decent cycling links from the side streets to locations like a school on one of the widest section of the overall corridor. 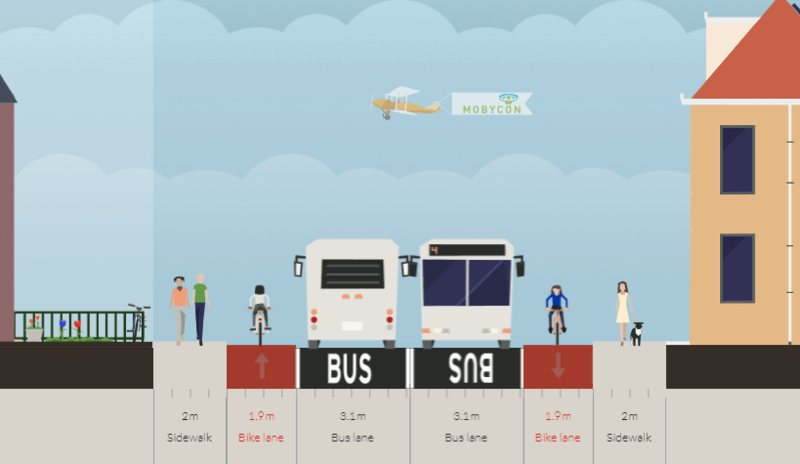 The draft design hardly tackles how much space is left to cars and tacks on bus priority as an added extra. Cycling, walking and public space are pushed under the bus for the sake of the car. Fecks sake…. The misery and ineptitude continues …. And no doubt they’ll come up with the usual bollox of “This is only the design phase. Tell us your concerns, and we’ll see what we can do”. Instead of actually, you know, doing their fecking job and designing it properly from the out-set and not relying on concerned citizens who might happen to have a couple of ideas. And even aside from that, we all know from bitter past experience that what will happen is that they’ll implement these designs, or something very like them, and then say at the end “Well, it’s too late to change them now”. 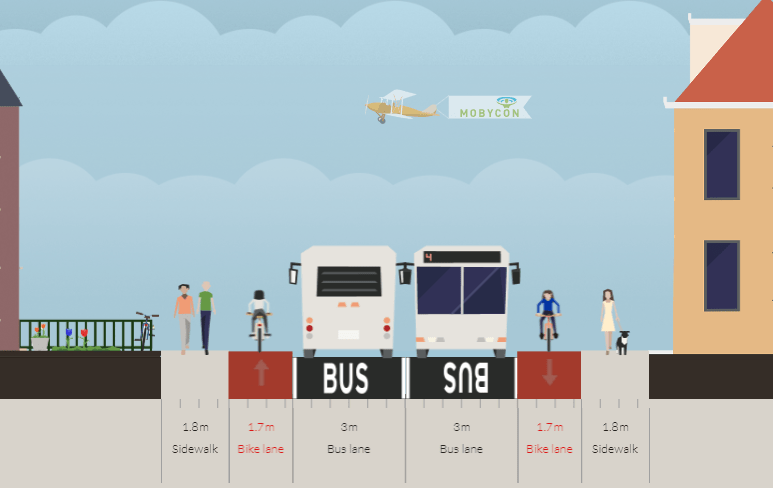 It’s hard to believe that plans are still being made to put a bike lane between buses and cars. Cutting away the wide path at George’s Plaza where there’s a usually empty Dublin Bikes station, appears both regressive and pointless. Getting to and from my place of work there could well be a lot less safe, except possibly that the junction at Brunswick St might possible be improved as at least one cyclist was injured there quite possibly through a lane layout that has two left turning lanes, the righthand one also going right as well as left. 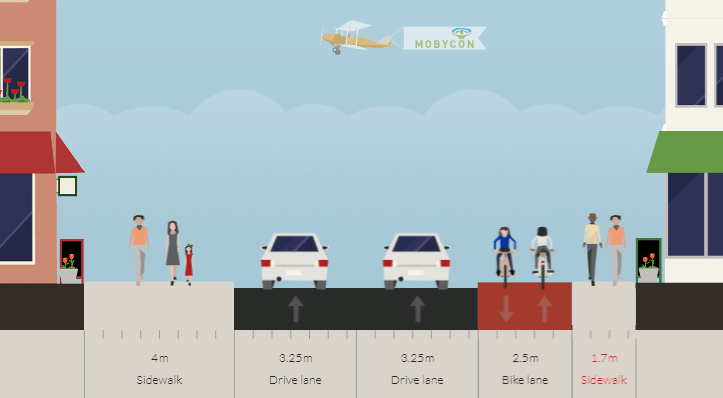 It looks to me to be a truly terrible, over fussy design, reducing the safety of vulnerable road users on bike and foot, needlessly creating conflict between road users, the usual stuff in this country. Hypothetical question: If allocate4cycling happens, what is to prevent the money being spent the same way in more places? If only money is allocated, nothing will prevent it, If money and space are given, money won’t be spent in the same way. Getting the money is the easy bit. Getting higher standards will be harder but if politicians invest substantial sums, they will want results which low standards can’t deliver. A disaster waiting to happen. Traffic will only get worse until we get an underground rail system. Taking gardens to accommodate anyone disgusts me. @Darren How exactly is it a disaster? 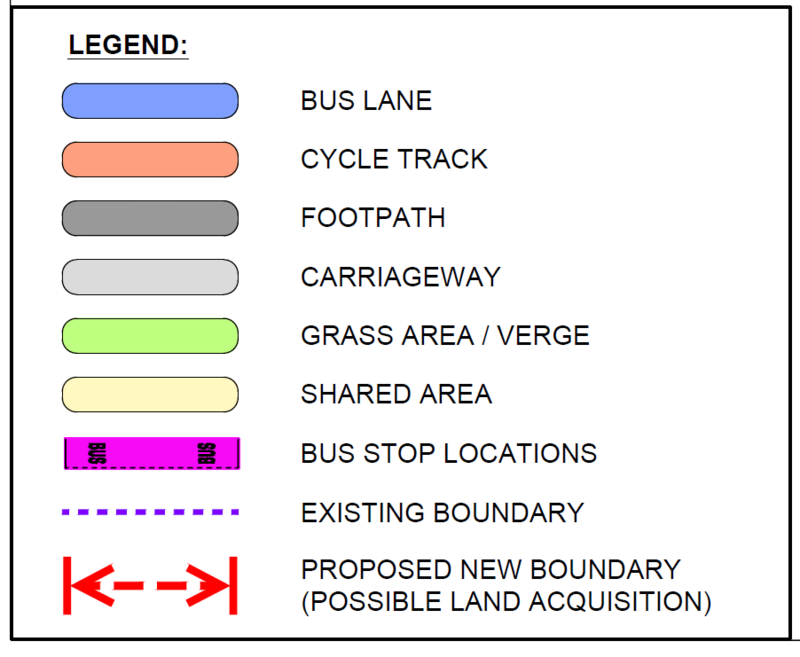 As for “taking gardens” — can you see anywhere on the BusConnects drawings that they are planning to take people’s full gardens? All I can see is little bits here and there is all and most people will be left with reasonably large gardens for inside — underground railways and major road projects usually require the CPOing of full buildings including houses etc.